The Dithers is an Old Time Fiddle Duo based in Santa Barbara, California that plays instrumental, Old Time American Fiddle Tunes. They play for all types of occasions, from casuals to weddings, parties, corporate events, clubs, pubs, and festivals. They have a repertoire of hundreds of tunes, all of them infectiously fun with a tendency to incite spontaneous, involuntary dancing! People of all ages love The Dithers. Erika Smith, fiddle, is a California native and well-known to those around the central coast’s Old Time Music scene. 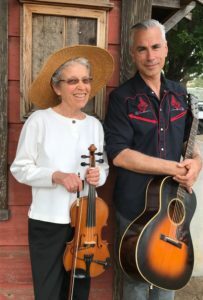 With over forty years experience of down-home fiddlin’ and close to fifteen years playing for Contra Dances in and around Santa Barbara, Erika has earned a solid reputation for being “the real deal” in authentic American Music.